Need your order urgently? Select this option "Rush My Order" for all your last minute items needed for your special event. By selecting this option your order will go to our priority orders and we guarantee that it will be processed and shipped to you within 24-48 hours! (Sundays and Public Holidays excluded). You will also be notified when your order has been despatched. This listing does not expedite shipping times. If you require a quicker posting option, please upgrade to express post shipping for your order. 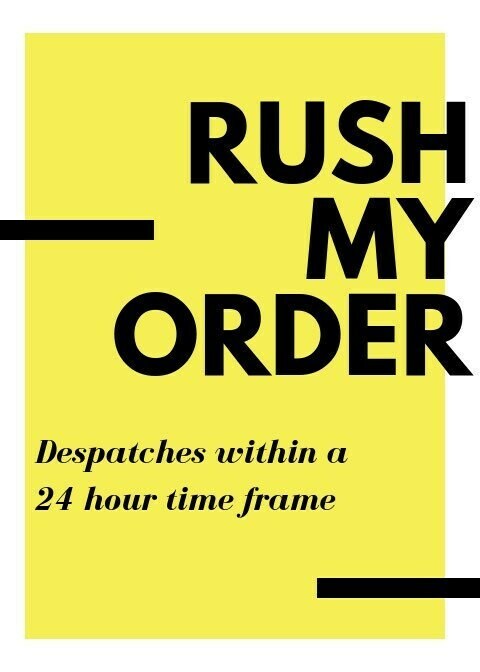 Please note: If you are ordering multiple items and need all items priority and rushed, you must order the same amount of rush orders (this does not include 6 items of the same decal i.e. if you are ordering 6 decals of the same type then only one rush order needs to be purchased but if you are order 2 lots of different items or decals (of a different type) then more rush order items must be purchased. *If you have any questions regarding our current turn around times please feel free to message us before check out.